The Holocaust is one of the most important events of the 20th century and is perhaps the most significant genocide in human history. A genocide is a mass killing of a group of people for ethnic, religious or racial reasons. The term ‘holocaust’ refers to death by fire in reference to the way that people were executed during the event. It unfolded during the reign of Adolf Hitler in Germany and the major events of World War II. During the Holocaust, which occurred from 1933 to 1945, over 11 million people were executed. In total, 6 million were Jewish people, while the other 5 million included several other groups, including: disabled people, homosexuals, communists, Soviet and Polish prisoners of war, gypsies, and other religious and ethnic minorities. One of the ways that the Nazi regime carried out the Holocaust was with the einsatzgruppen. The einsatzgruppen were Schutzstaffel (SS) death squads that captured and killed Jewish and other minorities during the events of World War II and the Holocaust. In general, the death squads followed directly behind the front line Nazi forces as they conquered territory throughout Europe as part of World War II. Once the Nazi forces had captured an area, the einsatzgruppen would begin the process of rounding up any undesirable people living in the region and carry out their executions. 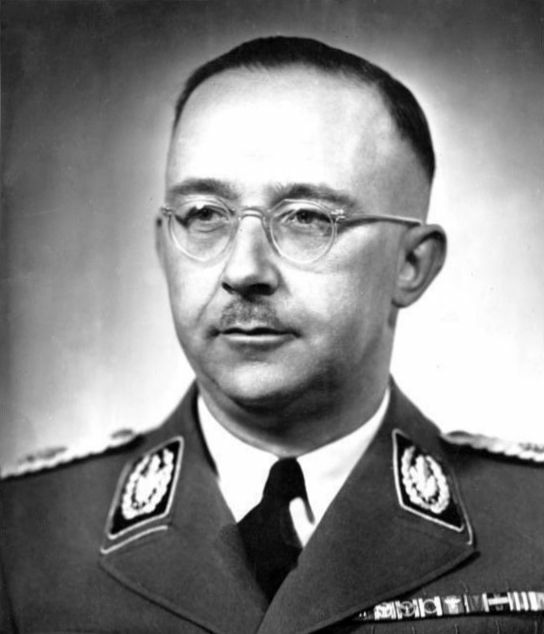 Since the einsatzgruppen were part of the larger SS structure, their actions were under the direction of the head of the SS, Heinrich Himmler. The einsatzgruppen were used extensively in the eastern areas of World War II following Nazi Germany’s invasion of Poland in September of 1939. In his book, Mein Kampf, Adolf Hitler identified his strategy to capture more lebensraum (or ‘living space’) for the German people. Hitler believed that Germany needed more living space in order to harvest more food to allow the German population to increase at a faster rate. In his book, he stated his desire to use land to the east of Germany to fulfil this purpose. Specifically, Hitler was referring to Poland and the Soviet Union which had large populations at the time. Hitler’s plan was to capture the countries through Operation Barbarossa, which was the name for the Nazi German invasion of these eastern countries. To complete Hitler’s goal of securing living space for German settlers, the einsatzgruppen were to begin the process of executing the people deemed undesirable by the Nazi regime, including: Jewish, Gypsies, and large populations of Polish prisoners of war. After doing so, the remaining Polish and Soviet people were to be turned into a form of slave labor for the Nazi settlers. Today the einsatzgruppen are remembered for their horrible atrocities. For example, after capturing people the death squads would then take them to remote areas in order to carry out a mass killing by firing squad. The people about to be executed would arrive to find a mass grave already dug or would first need to dig their own grave. They would be forced to line up at the edge of the mass grave as the death squads began firing at them. 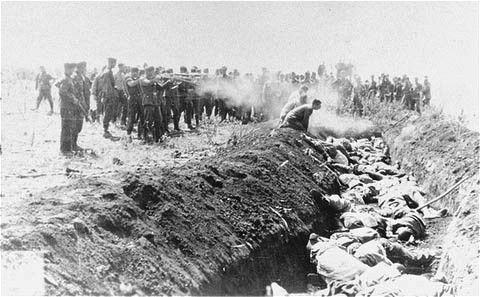 Historians estimate that the einsatzgruppen executed over 2 million people in this manner, including 1.3 million Jewish. 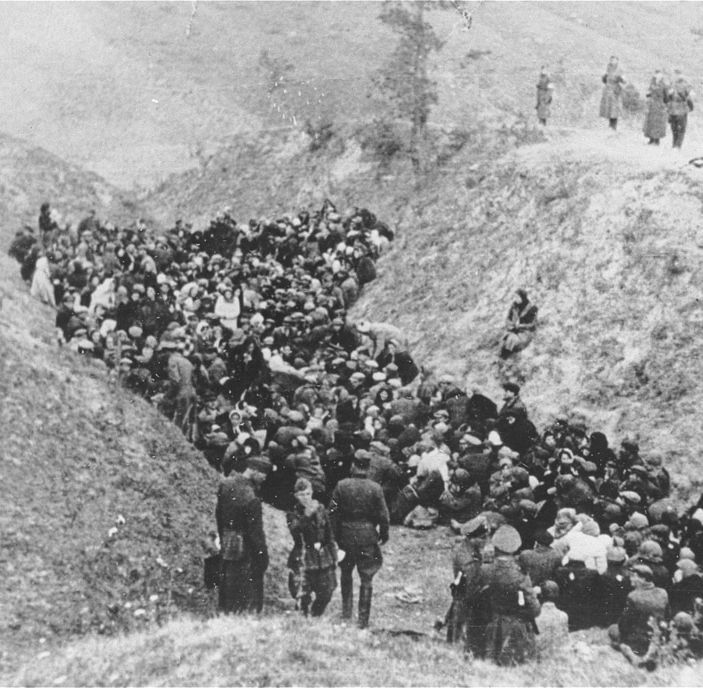 The largest mass execution carried out by the einsatzgruppen occurred in the Soviet Union in an area called Babi Yar. The execution took place in a ravine from September 29th to the 30th in 1941. The Germans had captured the area on September 19th of that year and the einsatzgruppen worked quick to carry out the execution of 33,771 victims. The Germans had told Jewish people in the city of Kiev to report to a German outpost on September 29th. Since many of these people were unaware of earlier executions, they reported believing they were going to be deported out of the Soviet Union. Instead, they were marched north of Kiev and into the ravine. Once there, they were made to strip naked and lay down on the group in rows as the einsatzgruppen shot them in the back of the head. Because the execution lasted over two days, people were forced to lie on top of the bodies of those killed earlier. 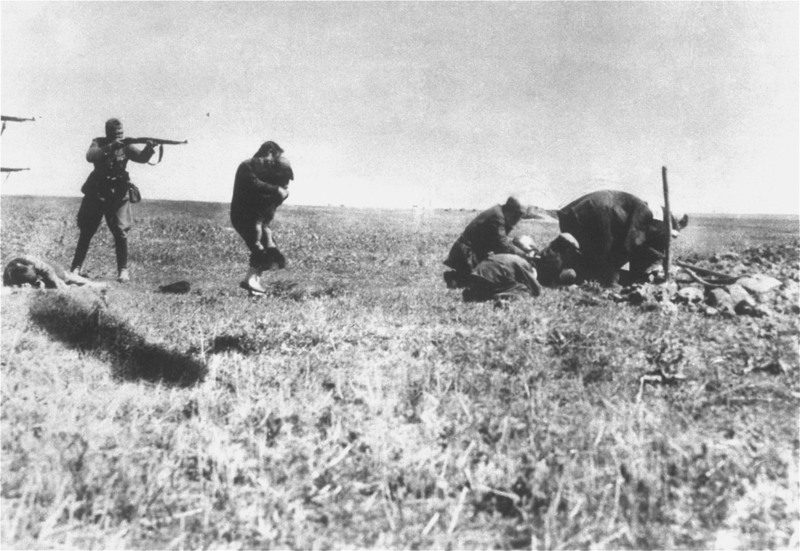 Nazi guards and Ukranian police, who assisted the einsatzgruppen, kept watch to ensure no one escaped. The einsatzgruppen were one step of the larger ‘Final Solution’ but were significant because they highlighted the brutality of the Nazi regime.